Do you wince when your parent weighs in yet again on your relationship…your career…your house and clothing…your diet…and other aspects of life that are ­really none of that parent’s business? The adult children of overbearing parents often endure this treatment for decades—they either feel powerless to stop it or feel that the emotional cost of doing so would be too high. Those who do stand up to an overbearing parent often do so by lashing out in anger and saying something hurtful that causes or deepens a rift in the relationship. They may say or think otherwise, but in most cases, the adult children of overbearing parents are stuck in the parent-child relationships of their youths—it’s as if they’re still 10 years old and their parents still get to decide how they live. The secret to breaking out of this unhappy pattern is to understand that you—the adult child—hold most of the power in the relationship—even though it might not feel that way. Sure, when you start to put limits on a parent’s controlling behaviors, he/she likely will respond with anger or even the silent treatment. But when your parent realizes that you really mean it, he’ll eventually accept limits. 1. Stop answering every call or text. Cell phones and text messaging mean that your mom or dad—or your spouse’s mom or dad—has access to you 24/7. But in fact, it’s you who are in control if you take that control. What to do: If you have a parent who contacts you repeatedly over the course of a day and generally has nothing important to say, explain that you won’t be repeatedly interrupting your other activities to answer these calls or texts right away, and offer a few good times when the two of you generally can talk. Then as the nonvital texts and/or voice mails come rolling in, wait to respond until it’s convenient for you. Not leaping to attention each time an intrusive parent tries to make contact is a crucial first step in rebalancing the relationship. This might feel uncomfortable for you at first, but within a few days or weeks, it will start to feel (and will in fact be) empowering. Of course, if there is some reason to believe that a parent’s message could be an emergency or a request for ­essential information, it’s best to respond as quickly as possible. 2. Declare specific topics off-limits—and then express love. Overbearing parents often insert themselves into ­areas of their adult children’s lives where their input is not welcome, such as advice about romantic partners, careers, cooking or homemaking skills, weight, spending decisions, wardrobe and grooming choices, child-rearing decisions and fertility problems. 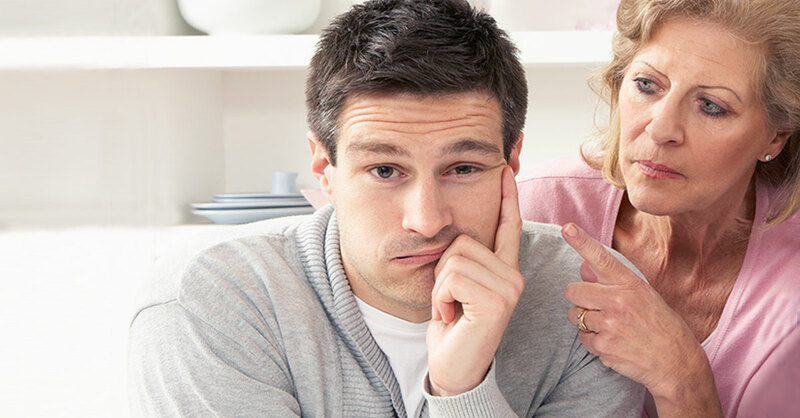 What to do: Think about which topics truly annoy you when your parent weighs in on them. Then the next time the parent raises one of these topics, politely explain that you do not enjoy discussing the topic—and that you do not want to speak with him about it anymore. Before your parent can react to this, express your love for the parent and/or your appreciation for that parent’s willingness to provide advice. Adding an expression of love for your parent whenever you place a topic off-limits reduces the odds that the parent will react angrily. If your parent ­responds defensively—“I was only trying to help…”—say, “I know, and I love that you want to help me, but let’s talk about something else.” After you’ve done this once, you may find that it’s easier in the future to put other hot-button topics on the “do not discuss” list. Chances are, you’ll have to repeat your unwillingness to discuss a topic several times before your parent catches on that you’re serious and that you’re not backing down. Try not to express your frustration when you must repeat this request. 3. When your parent raises an off-limits topic by saying that he knows he isn’t supposed to raise it, respond with gratitude. Once your overbearing parent gets the message that you are no longer willing to discuss a topic, don’t be surprised if he raises it anyway by calling special attention to the fact that he is raising it. Example: Your parent might see your new car and say, “I know I’m not supposed to discuss your spending habits…” and then trail off, making it clear that he does not approve of the purchase. These kinds of “noncomment comments” can be intensely annoying. What to do: Rather than voice ­frustration, see this as a sign of progress and use positive reinforcement. That’s more likely to encourage the truly desired behavior (not raising it at all) in the future. 4. Inform your parent that you cannot continue with family traditions or rituals that no longer fit your schedule. Overbearing parents often consider the time they spend with their adult children “tradition”—and they might have lots of these traditions! Examples: We always have Sunday dinner together—it’s a family tradition…we always spend two weeks each summer together at the lake—it’s a family tradition…etc. To an overbearing parent, an adult child is behaving irresponsibly each time he fails to maintain these traditions. But these frequent obligations can become burdensome as your life changes—especially if you have a hectic career, live far away and/or have kids of your own who have numerous activities and commitments. What to do: If a “tradition” has become a burden, don’t just apologetically skip it now and then. That avoidance doesn’t empower you or ­reset the relationship—it just lets your parent make you feel guilty each time. Instead, acknowledge the tradition, but clearly state that your participation in it must change. Example: “I know we have a tradition of getting together every Sunday, but we’re not going to be able to do that anymore. The kids just have too many things going on for us to keep that up every week.” Once there is no longer an expectation, you may opt to participate in the activity with the parent when it makes sense for you…with much less stress and no guilt. Helpful: If there is more than one tradition you wish to break, spread this out over several months or longer. Ending numerous traditions all at once might make your parent fear that you are planning to break off all contact. If your adult child is slow to respond to your messages or doesn’t respond at all, you might be an overbearing parent. Other tip-offs are that your child is hard to pin down about dates or plans…gets together with you less often than before…uses schedule issues with your ­grandchildren or his/her spouse as an excuse…keeps reminding you how busy he is…acts annoyed or short-tempered when you do get together…balks at or dismisses your suggestions or ideas…criticizes you more often than before…has a grandchild or spouse call you instead of calling himself…seems more abrupt in conversations. If these behaviors sound familiar, you can begin to remedy the situation by paying more attention to the subtleties in your interactions with your child—and then changing your behavior. Depending on the situation, you might try calling less ­often…be less demanding…be more flexible about plans (and less rigid about what you want)…accept that your adult child has a busy life. You also can ask your child directly what the problem is, although don’t be surprised if he has trouble articulating it. The truth is, by simply changing some behaviors and giving your child more space—being less intrusive, even less involved—you may find that your relationship improves.